I made it into town at 10, locked my bike outside, and checked in at Laurel Highlands for their 10:30 trip on the Lower river. 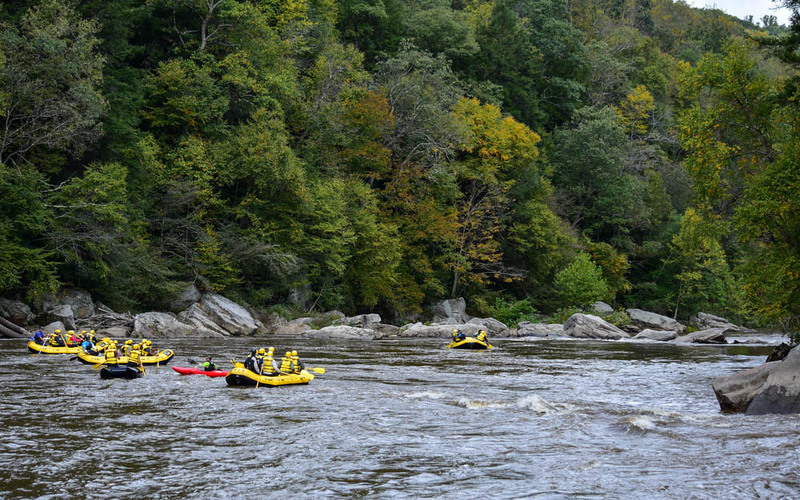 Soon, we walked down to the public launch just after Ohiopyle Falls. 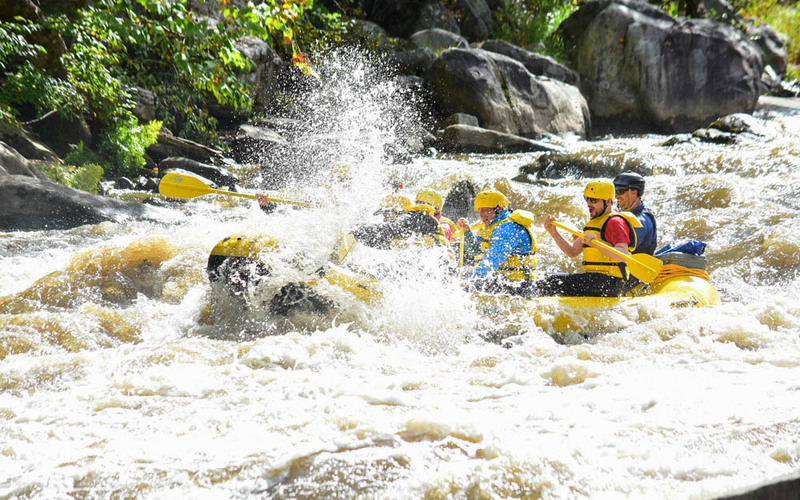 One of the guides explained all of the safety points to us, like don’t stand in moving water because foot entrapment is definitely not party. 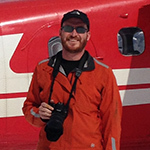 Then they assigned us to our rafts and we pushed out into calm water and the onset of a Class III ledge system. I was put on a 16 footer with a group of 5 nuclear energy workers from North Carolina. They were all part of a team at their jobs, and liked to go on outings together as well, probably because teambuilding. 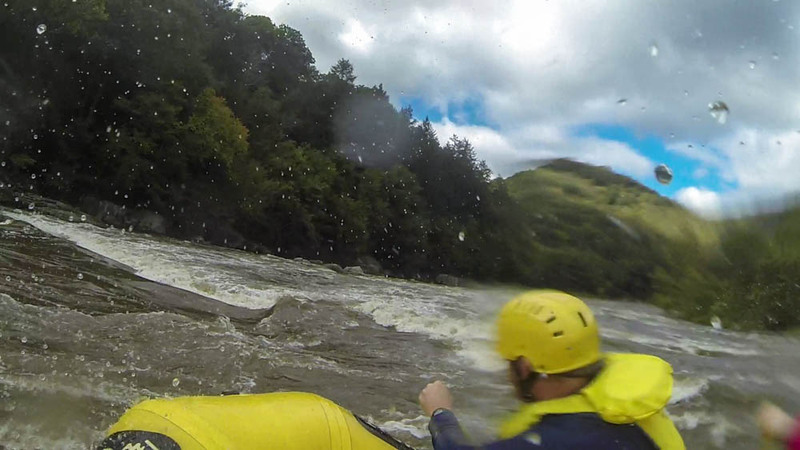 Our guide steered us into the middle of Entrance Rapid, a meaty Class III with a few really good wave-holes. Thanks to all the rain from earlier that week, the levels spiked that day to about 2ft above average. What would normally be bone city at the end of the warm season was a lot of smooth V-waves and big churning holes. There was plenty of swell and rockout for the river enthusiast. Run a line. Take a swim. Get all out in it. Appalachia. Cucumber Rapid was next, a big ledge of Class III-IV. 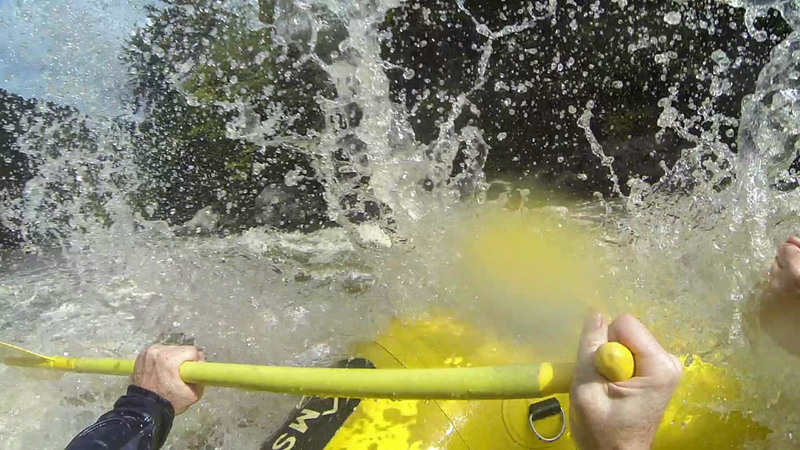 We put the drop on it and charged out on the tailwaves and into calming water. A photographer caught us in mid-yell. This went on for the next mile. 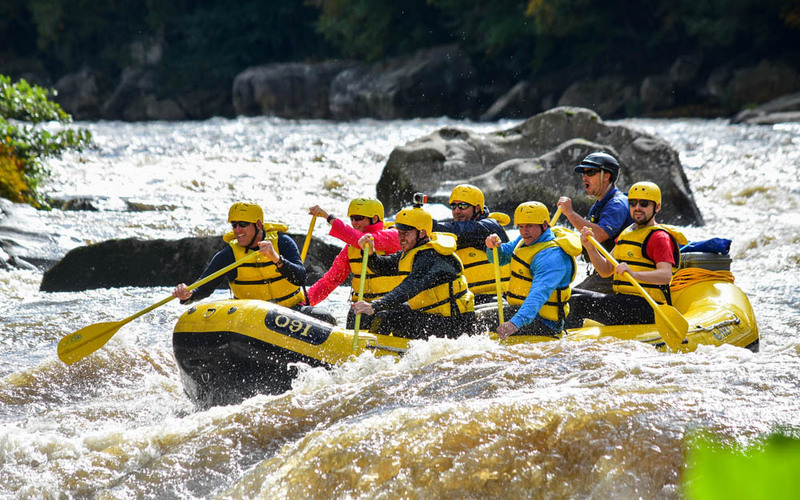 In your typical Appalachian style, there was a sweet rapid with a good hit and flipping potential, followed by a break of flatwater and lots of time to gather up your belongings and swim back to the boat. After Railroad Rapid, there is a loop takeout on the right where you can hike back to the top to run the sweet back to back mile again. My packraft would be great for this. We passed under a bridge and went for two miles of calm water with an occasional riffle. Our guide had an archive of old river jokes, stories and puns to keep us entertained in the down time. I’m sure he’s had plenty of river trips to fine tune his act. He was like a comedian, except that the back of the raft was his stage and we were the audience. When we took out for lunch, I realized that I was cold. I rented a wetsuit, but realized I probably could have used a spray jacket. Nothing I can do about it now. Maybe I could get my core temperature back with food. That didn’t help. 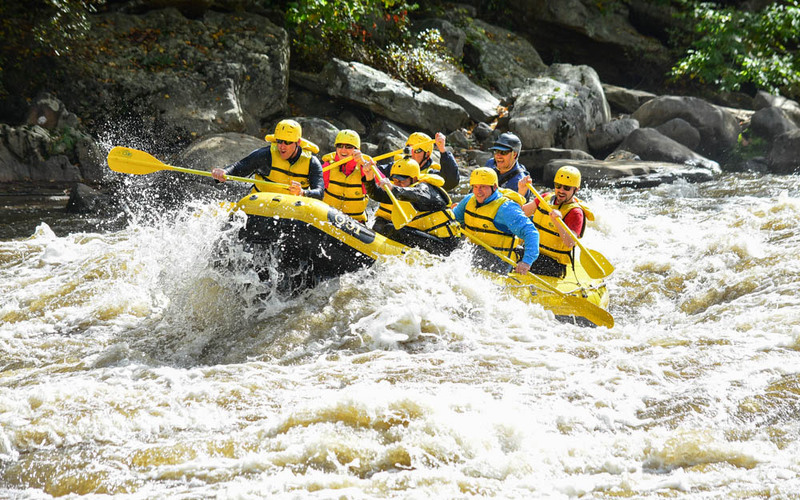 Although shivering in the cool October air on a sweet river trip, I’m pretty sure I’m right to say it’s worth it. I should have brought my drysuit for this. I felt better again when we got moving. We approached Dimple Rock, a notorious undercut on river left. This one made me nervous. It is the site of numerous fatalities over the last 30 years. The guide had us push hard and steered us into the main line just right of it. It is a wide, easy channel that pillows on the edge of the rock and drops a few feet after. So as long as you don’t fall out at the top then you’re fine. All the rafts got through without incident. 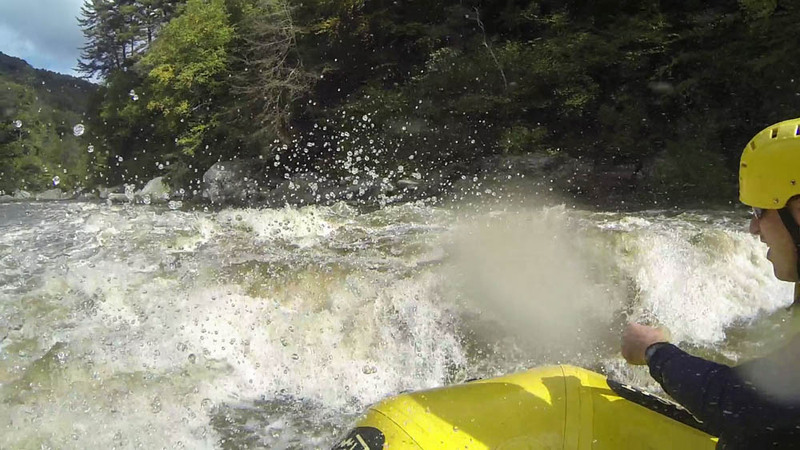 For the next three miles, we went through numerous rocky rapids, pourover holes and ledges, and then more flatwater. Some of them channeled into boulder gardens with multiple lines. But nothing rated higher than a Class IV at a high swell. 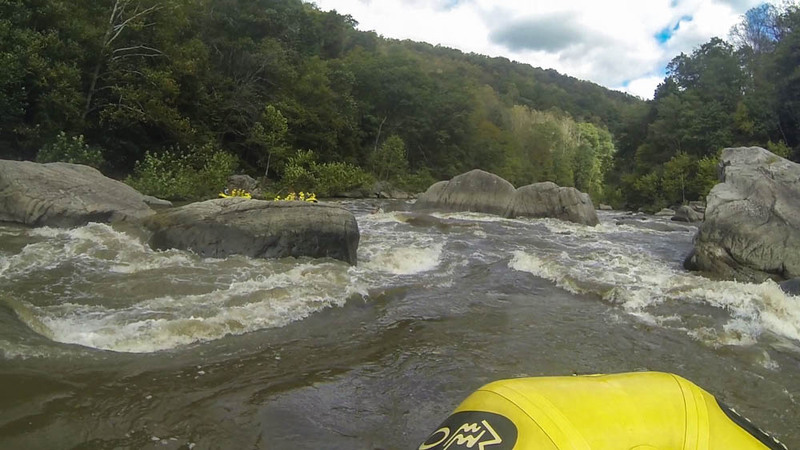 This wasn’t like the Upper Yough, which is a technical rocky section with a lot of nice Class V in your face. I’d love to shred the gnar out of it sometime. We got back to the town and I said goodbye to the guide and the nuclear energy team. 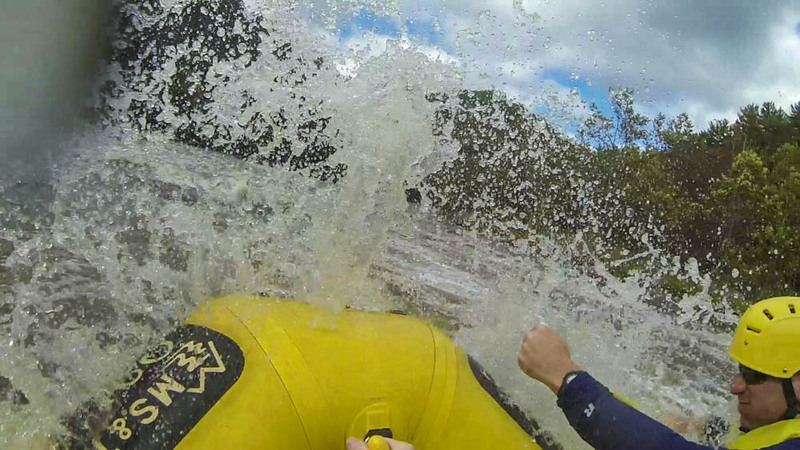 But not without first buying a set of photos of our trip – our evidence of just how hard this river rocks. I went next door and tried to warm up with food and coffee. It kind of worked, and kind of not really. Soon, I was back on my bike and heading east. Finally, my blood heated up to a good core level as I dried off on the trail. 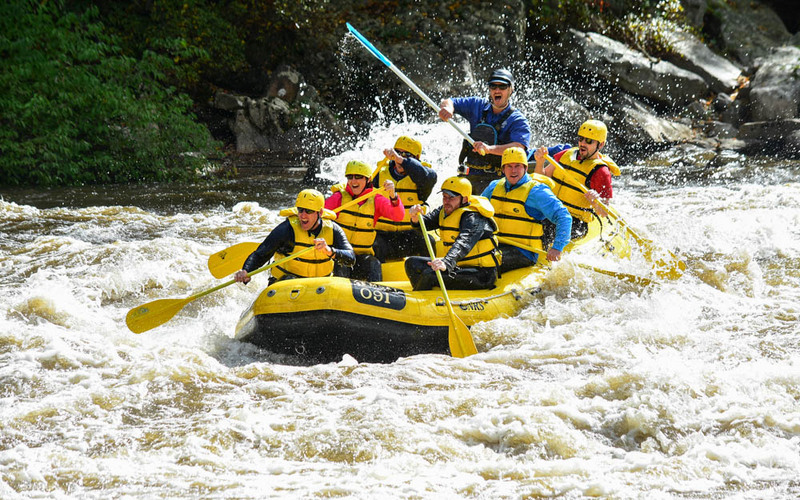 I recommend Laurel Highlands to anybody looking for a good river trip in southwest Pennsylvania. 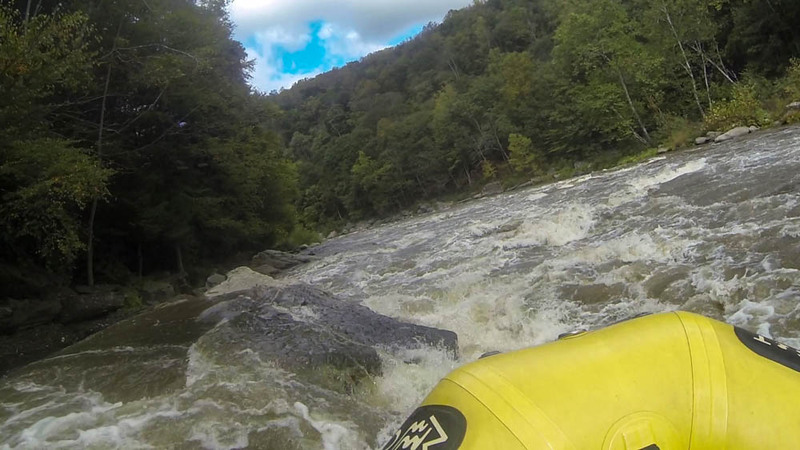 The river valleys are beautiful and full of sweet whitewater hits. 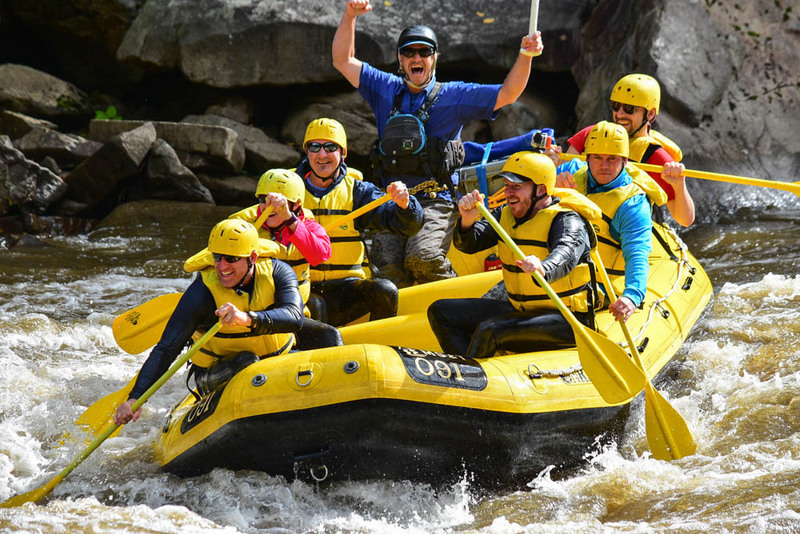 And their guides know the river well, and can bring the good times and bad jokes! This story continues on the C&O Towpath.